Balance is something that many of us seek in our lives. It is also something that often eludes us. The Autumnal Equinox, on September 22, marks the moment the sun crosses the celestial equator. When the sun shines directly on the equator, the length of day and night are the same. At this time, the last days of the warm summer usher in the fall and its harvest bounty. In farm life, this is a time to take a quick pause to enjoy the fruits of our labor. The clearing of land, plowing, seeding, hoping, weeding, watering, watching, and tending has all paid off. Here at Learning Tree Farm, we love to share and celebrate this important pause with our community during our annual Autumn Fest. As a staff, we are able to breathe deeply and watch as hard work has allowed this community to take root and grow. For the Nature Preschool, Autumn is a time to shift from our summer adventures to coming back together in community. Our program is a mixed age classroom with children who are three to five years old. We greet old friends and welcome new with eager anticipation. Because the children return from year to year, they can witness the same cycles and make comparisons to their last experiences there. 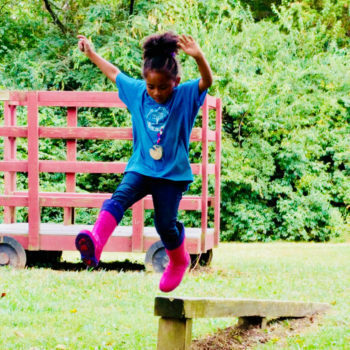 We balance each other, as younger children benefit from watching their older peers explore with confidence, trusting their teachers as we play and discover together. This pause doesn’t last long though. Soon after, we harvest, preserve, and replant for a late fall crop as well as prepare our garden beds and animals for winter. We continue learning about each other, our place in nature, and our work within that place to grow food and sustain our land for another trip around the sun. Balance in our busy lives is an illusion as we ebb and flow with the cycles of the Earth. The trick to enjoying it all just might be in noticing a larger pattern and seeing that balance over time.